This highly upgraded home offers unobstructed backyard views of beautiful mature trees found throughout its desirable Mission Viejo neighborhood of Timberline. Soaring ceilings, recessed lighting, custom crown molding & baseboards, and gorgeous wood flooring throughout add to the elegance of the bright & open floor plan. 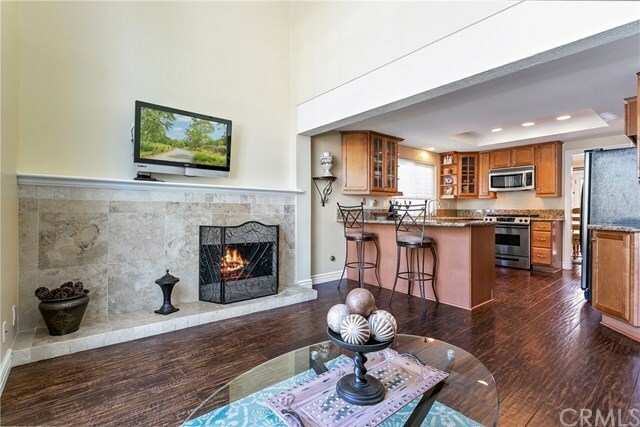 Enter through the double doors to the spacious living room highlighted by a stone fireplace. The well-appointed kitchen features wood cabinetry, granite counters and stainless steel appliances. The family room flows seamlessly from the kitchen and offers grand floor-to-ceiling French window and a second warm fireplace. Just off the kitchen is a charming dining room with double French doors to the expansive wrap-around entertainerâs backyard with custom fire pit and outdoor kitchen. Up the staircase is the master suite with impressive views through double French doors, roomy walk-in closet with custom closet system and en-suite bathroom with dual vanities, high-end fixtures, custom tile work, and frameless glass-encased shower. Additionally find a secondary master bedroom with itâs own private en-suite bathroom. The 2 generously sized secondary bedrooms offer ample closet space, mirrored closet doors, plush carpeting, and a shared full bathroom with stylish upgrades. Convenient upstairs laundry and two car garage. Near award-winning schools, parks, shopping & dining, this home is an ideal choice for full and vibrant Southern California living. Directions: I5 Fwy to Alicia Pkwy go EAST. LEFT onto Muirlands Blvd. RIGHT onto Turf Ave. LEFT onto Live Oak Dr. Home is on the RIGHT.